How about a movie on the life of Susan Polgar? Susan is pictured on the left; Scarlett on the right. 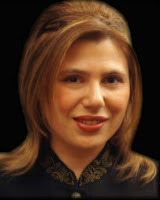 Susan Polgar's picture from Susan Polgar's Blog. Used with Permission. Scarlett Johansen's picture is from publicity still. And thank you for visiting. I'd like to see the biopic. Scarlett was Susan's choice, not mine. I would like Mindi Emanuel.